If you tricked someone an elaborate trick that it is difficult for the simplicity of his consciousness to understand, And then he acted outrageous or out of the law actions, with or without intent, so you are his partner in the crime or you are only the criminal , the deceitful and the profane man. And , If you are a teacher and Misled your student or someone who trusts you with false information ,and he went to the exam and be failed , so you are undoubtedly responsible for everything that his understood and wrote and about his failure. 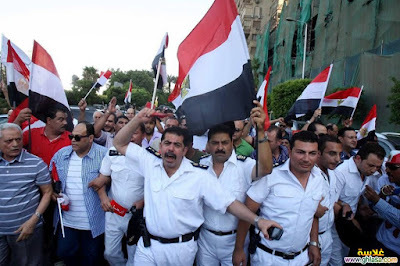 Also, all of the sincerity of the black media propaganda, such as the sale of Nile, Pyramids, Sinai and others, and came out on 30 June 2013 calling for a coup against the first democratic experiment in the country ,so The media and those who control it, bear the moral, legal and legitimate responsibility for it, because the victim acted on the basis of the information provided by his false testimony. In general, the principle of granting legitimacy and respect for any revolution is the need for the revolutionaries to be aware and confident, whether in the strength of arguments or results, and not through deceit and exploitation of low people's awareness. More than four years have passed since the festive crowd held in Tahrir Square on June 30, 2013. It was indeed a great crowd, But it was also not the biggest crowd in the streets of Cairo in the last six years; it was preceded by 4 larger and more dangerous crowds, A crowd from it was revolutionary, And two other crowds resembled a festive crowd. Was preceded by the great revolutionary crowd that came to the streets of Egypt on the Friday of anger during the events of the real revolution, this crowd came down to challenge the risks that may cost one's life; in order to prevent the damage suffered rightly, for decades, And was followed by the crowd of Mubarak's departure on February 11, 2011, a large ceremonial gathering that was seen as a pledge of allegiance from the masses to the fledgling revolution. It was also preceded by the rally held in April 2012 under the name of Islamic law and Legitimacy " Sharea and Sharia", which extended crowds in long distances in central Cairo and the fields of Egypt , And then the third large celebration rally that took place after the announcement of the victory of Dr. Mohamed Morsi in the same year. In fact, the June 30 crowd differed radically from all the crowds that preceded it, both in the subject and in the reasons; ; Because he walked in the opposite direction to her completely, and it largely crossed the old power against which the revolution took place and then returned it to power to be more fierce and cruel, He rightly deserved to be called a "counter-revolution" movement. It is also illogical to regard it as a revolutionary crowd, for many reasons. The most important of which is that the revolution must inevitably be against " Authority", Authority is the governing tools of the army, police, judiciary and the official media, Since these tools were planned, orchestrated, financed and called for this crowd secretly or openly - it was necessary to consider this movement in a counterrevolution. And because what happened was a coup, it also overturned the criteria of logic; The murderer occupied the place of the victim and put the victim in his place , The person who killed him without sin is equal in Islam killing all people , The process of killing him has become a normal work, in which he honors the murderer and gives him the qualities of sacrifice, patriotism and redemption. And became a traitor is the one who resists the sale of the soil of the homeland and the national is the one who sells , And the patriot is the one who pleases Israel and the client who refuses it, and the terrorist who objects to such illogicals and insists on justice. Now, more than four years after the June 30 celebration, everyone - even their most vocal supporters - has confirmed that it was a coup against the January revolution. The sale of land to foreigners such as the islands of Tiran, Sanafir and Chios, the destruction of cities ,the displacement of its people, tens of thousands of Egyptians in the prisons, Building about 20 new prisons, With the killing of thousands of victims of Egyptian civilians and recruits, the closure of the public sphere and the blocking of sites and the arrest of journalists, The return of "dawn" visitors, the collapse of the economy and the return of corrupt people to their posts and so on ...all that can'not be the results of a revolution.